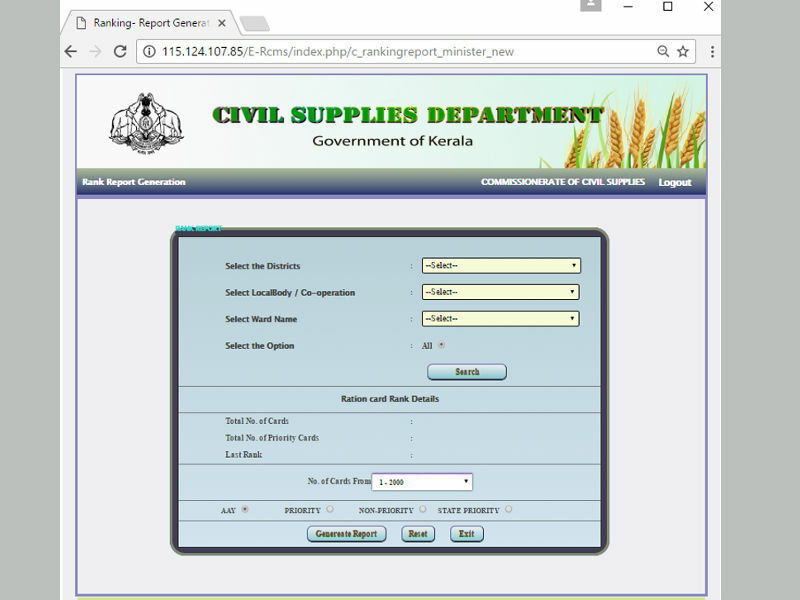 Ration Card Owners are advised to either view online draft beneficiary details or print out available at concerned ration shops / Panchayats Offices / Village Offices / Taluk Supply Office (TSO) / City Rationing Offices. If found any discrepancy or complaints, report them to concerned TSO / City Rationing Office in a prescribed format. How to Check New Ration Card Draft Details Online? A detailed page of your ration card will be displayed. Check each of the details and note down the mistakes if any. Then click to the next button given at the bottom right corner of the page to get members details. Check these details and note down mistakes if any. Take a print out of the page for your future reference. If you have any correction, download proforma form and take print out. (If you are unable to download proforma form, it can be found at the end of this article or download it from here). After filling the form including the correction details, submit it to you TSO / CRO. How to Get Complete List of Ration Cards Under a Local Body (Panchayat / Municipality / Corporation) for Checking? 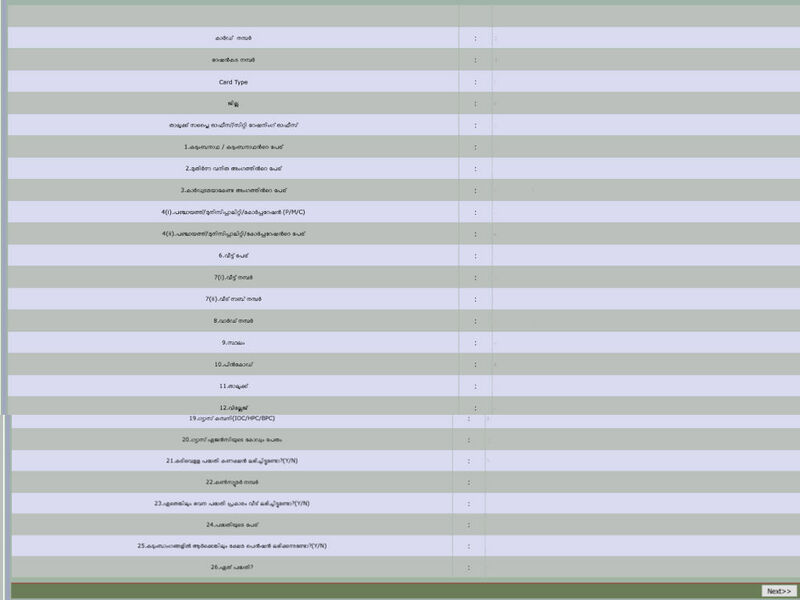 Select one of the radio button and click on Generate Report button. You will be directed to new page having maximum of 2000 names. If the list has more than 2000, select number of cards accordingly. Where to Submit New Ration Card Complaints / Correction? Complaints or correction on ration cards to be submitted to concerned TSO / CRO on or before 30th October, 2016. Verification and appeal on the complaints and correction will be done by first week of December, 2017. How to Process Claiming Priority Category Ration Card? Committee Head: Panchayat Secretary / an officer not below junior superintendent in the Municipal office. Committee Members: Village officer and Integrated Child Development Services (ICDS) officer. If claim has been convinced and approved by committee, the ration card will be included in the Priority Category. If rejected, Ration card owner can go for appeal against committee's decision else ration card will be retain as no-priority category. Committee Members: Social Welfare Officer ADC (general) and deputy director of panchayats. Decision of Appeal committee will be the final in this regard. Appeals on verification committee decisions: within 7 days after finalization. Completion of computerization and finalization of the system: March 31, 2017. Civil Supplies department extended collection centers further to Panchayats and Villages for Complaints or Correction on ration cards. It is an additional facility provided to public due to heavy rush found for last few days at its TSO / CRO. After experiencing heavy rush for submitting corrections and complaints on new ration cards, officials extended its deadline to November 5, 2016, instead of October 3o, 2016. Many of the existing BPL card owners found their status have been moved to non-priority category. This causes panic to them trying to claim why they wanted to be in priority category.